The Ministry of Industry and Trade and the Ministry of Construction hold a conference about recycling ash and slag waste from coal power plants as construction materials for the Mekong Delta on October 3. 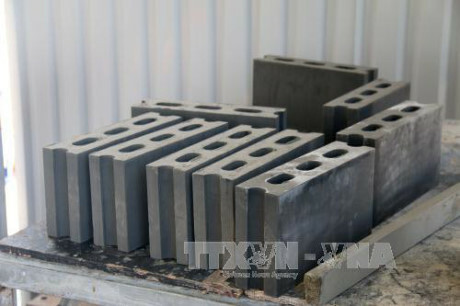 Mai Xanh Company recycle waste as construction materials. Vietnam has 21 coal power plants and it will have 57 plants by 2030 in accordance with the electric planning approved by the prime minister on March 18, 2016. The plants are discharging over 15 million tonnes of ash and slag waste each year. By the end of 2017, Vietnam will have about 40 million tonnes of waste. If more coal power plants are built Vietnam will amass 61 million tonnes of waste in 2018 and 109 million tonnes in 2020. There are three thermal power plants in the Mekong Delta, five plants will be built by 2020, and nine more will be built by 2030, producing 18,225MW and 13.67 million tonnes of waste. A huge plot of land must be reserved to store the waste which is a threat to the environment. Ash and slag waste from thermal power plants in Quang Ninh Province is also contaminating the UNESCO World Heritage Site of Ha Long Bay. According to the laws, all economic activities that pollute heritage sites must be relocated. However, the waste dumping site is some hundreds of metres away from the residential area and adjacent to the Bai Tu Long Bay. Moreover, the dumping site is being overloaded. The highest dumping location is three metres higher than the sea embankment. Pham Van Cuong, deputy director of the Ministry of Natural Resources and Environment, said there was no technical standards and guidance from the central agencies about recycling waste and its use by the construction industry. In order to deal with the waste, the Ministry of Construction consulted to the prime minister to issue Decision 1696 to recycle waste as construction material and gained good results after two years. In April, the prime minister approved Decision 452 to expand the project during 2017-2020 period. The Ministry of Industry and Trade asked the power plants to upgrade technology to be more environmentally-friendly, especially plants with out-dated technology. The data from monitoring system must be transferred to the Ministry of Natural Resources and Environment and local authorities. Director of the Department of Science Technology and Environment of the Ministry of Construction Le Trung Thanh said the project can help deal with 30% to 45% of the waste. However, criteria and standards for the project must be built in 2017-2018. According to Vietnam Electricity, seven partners signed contracts to buy 2.9 million tonnes of waste from Duyen Hai 1 and 2 thermal power plants in the Mekong Delta to be additive in cement production. The Genco 1 company is trying to build air piping to transport the ash to the port and save transport costs.